The Unifix Cube Drum Machine connects your knowledge of patterns and ratios to drum rhythms. Simply click on the cubes to make a pattern and press play — your Unifix Cubes will transform into a musical composition you can see and hear! You can also change between 16 cubes and 12 cubes, email rhythms to your friends, and play your patterns on six different homemade rhythm instruments, i.e., Tin Can Drum, Soda Can Shaker, Card-Comb Guiro, Fraction Tubes, Water Bottles, and large Melodic Tube Drums. How to operate the Unifix Cube Drum Machine: Scroll down to see the Unifix Cubes. Press the Play button and you will see and hear a rhythmic pattern played on homemade Fraction Tubes. To add more instruments, just press the "on/off" buttons for each row. Next, click on the cubes to change the pattern — one click for blue, two mouse clicks for red. 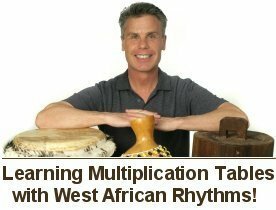 You may also change the speed with the Tempo slider, and explore a variety of rhythmic patterns by pressing the Patterns button — you will find drum rhythms from many countries, simple AB patterns, rhythmic ratios, ancient Aztec drum rhythms, Morse Code signals, and drum language phrases from Ghana and the Congo. Technical Note: You must have Macromedia Flash Player 6 for this activity to work. If you don't have it, you may obtain this free download from Macromedia at: http://sdc.shockwave.com/shockwave/download/alternates/.